First of all, some sort of introduction: I live in Serbia, Eastern Europe, a place that's heaven on earth for bootleg collectors. 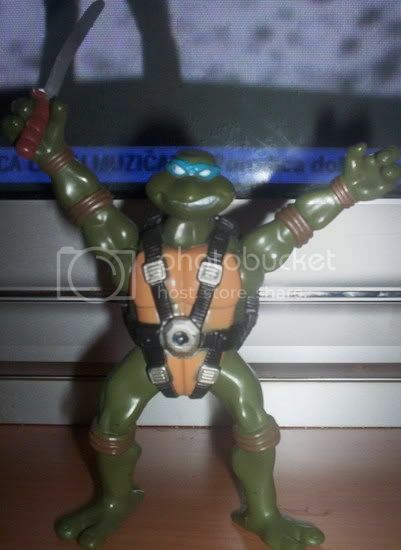 I' ve joined these boards just to share the excitement of my TMNT bootleg finds with you . Hope you like them! 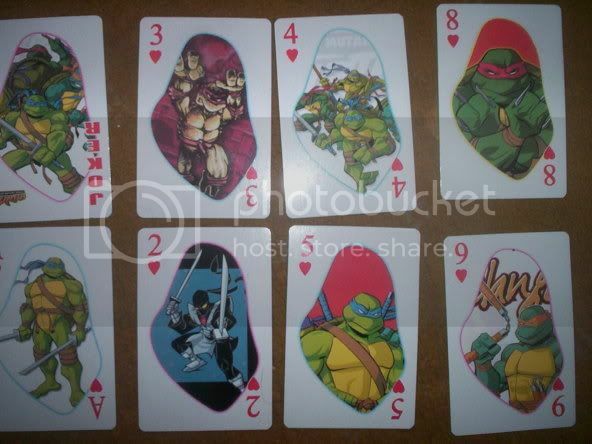 They all came on the same looking card - Mike w/bio card on the back, all 4 turtles on the front. 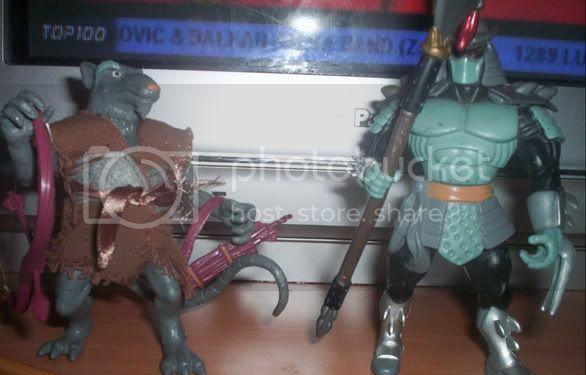 (BTW, these were the toys I tried to send to TMNTgal who I know from heman.org, but things didn't quite work out since... well, let's just say that the great number of bootlegs is the smallest of this country's problems ). 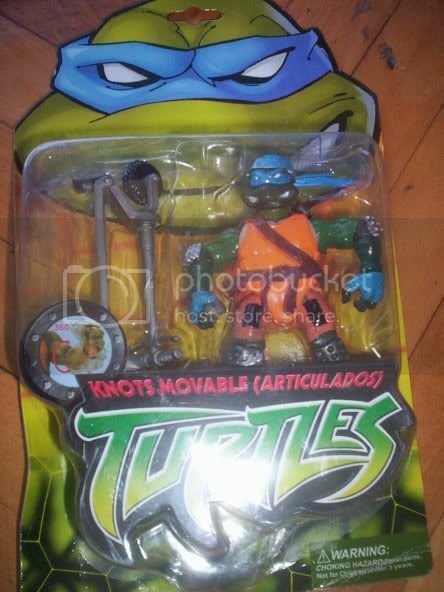 Next, here we have a Shellcycle with.... ummm... Don? 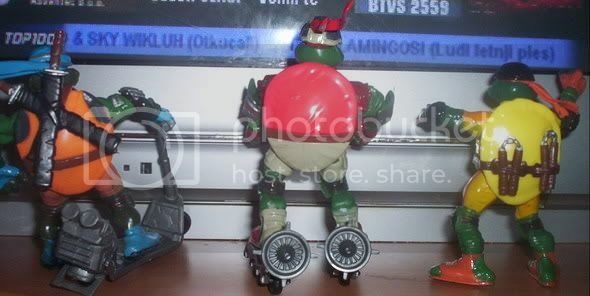 Only his feet and arms can be moved (look at his feet so see where they're cut for movement). 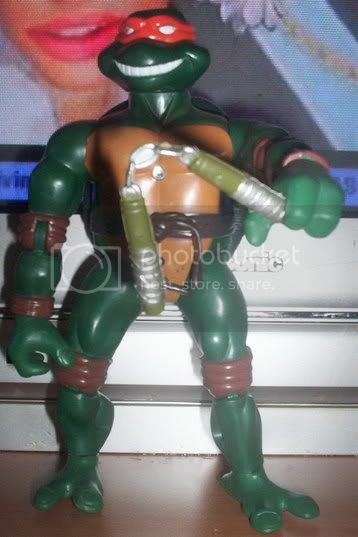 He also has red light and he's different from other turtles since he's made of hollow plastic. The cycle really shooth those arrows made of cans (thouogh the projectiles are completely gray/silver). And here's the cardback. 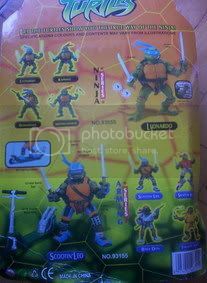 The original toys belong to "Ninja series", while these are a part of "Arming series", according to the back of the card . Hope you enjoyed looking at these pics, I just HAD to share my excitement with someone! Kittie february6 I'm Papa_Taz at the .org, though I don't post there much . 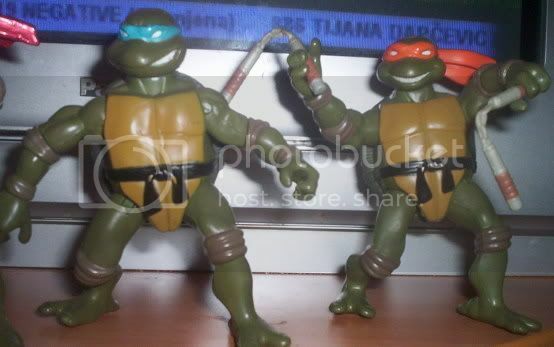 Sweet bootlegs...im normally not too big a fan of them but i like those! esp. the ones with the lights on chest/belt...great pics! Glad you folks liked them! Very cool PT. Oh yeah I remember you from the org. 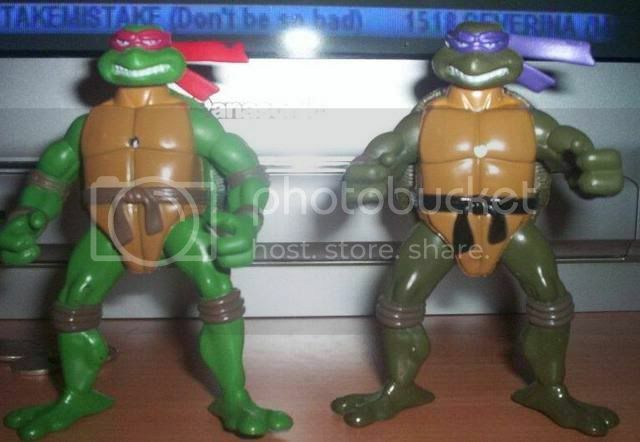 It's unfortunate you weren't able to find another set. 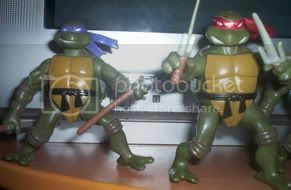 I really want that 1st series set of turtles. I'm keeping an eye out on eBay now. 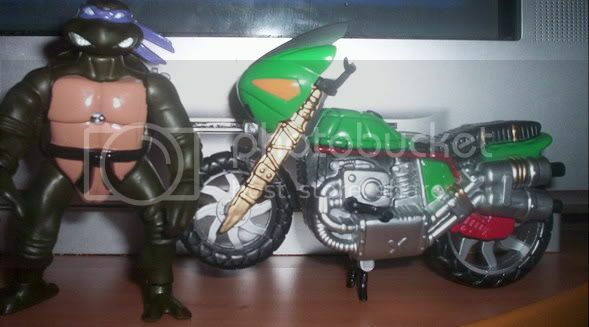 There's a lot of interesting bootlegs out there. 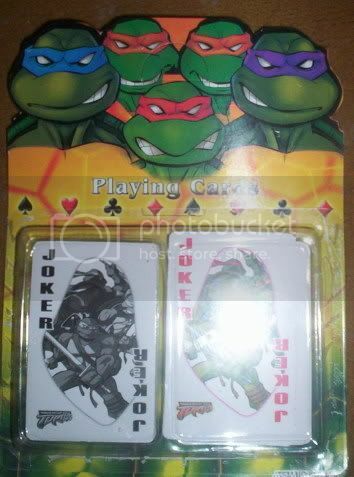 I've seen some with holo trading cards and some that light up. If you find anymore please post pics. 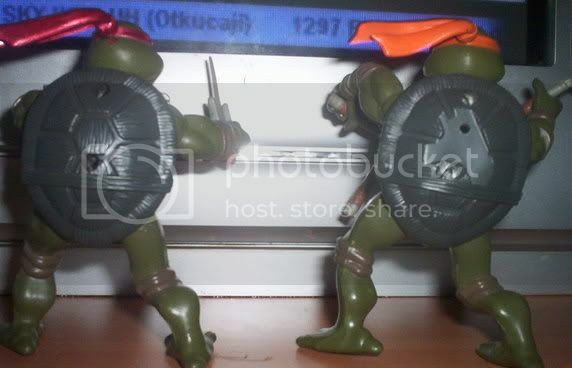 The cards say "Made in China" on the back, and I have been able to find some of these figs in those... what's the proper term? ... shops that have only stuff from China (and are, more often than not, owned by Chinese people as well), while others are from the local flea market... So, my guess is that they should be sold somewhere else in the world as well . 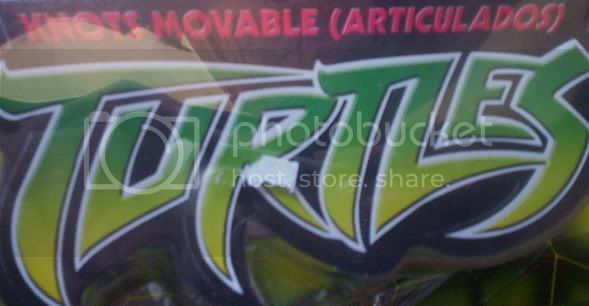 Fightin' Gear Turtles are here... at this rate, the bootleggers will catch up with the original line in no time . 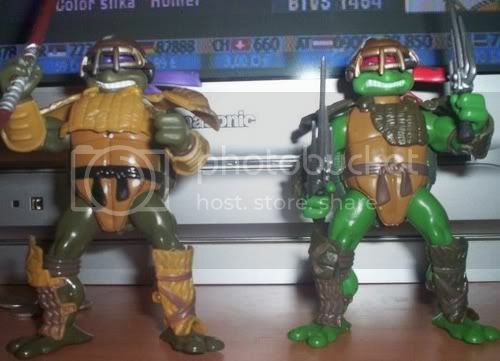 Anyway, here are the two turtles I have, both came on Raphael's card (BTW, the card is large as if these were deluxe figures), and they all (I've seen Leo as well) have the same armour and same body, which is far from super-poseable; the figs move only at "the big five". At least their coluors are accurate this time around . Enjoy! All the cool toys have the red light, didn't you know? It's all the rage in the bootleg world these days! 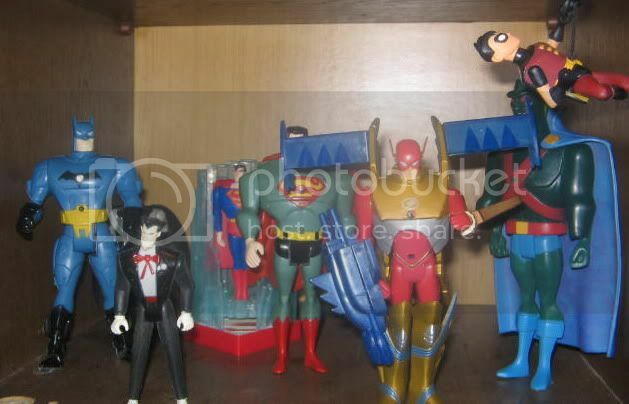 Look at these Justice League toys, for example... You'll see that they have it too, as well as the Marvel heroes (we have a light- up Hulk, Spider-Man and a few others in the house)... Come to think of it, only robotic toys (ie Transformers and Bionicle bootlegs I have) have no lights, which makes no sense at all, if you think about it for a bit . Last edited by Ecto Jedi; 09-08-2006 at 05:20 PM.